Event organizers: host your event at Quarry Road. From running and ski races to corporate retreats, Quarry Road Trails can accommodate your group's needs. Join the Colby College Nordic ski team for their spring fundraiser on March 17, 2019. Group and self-guided ski and snowshoe tours, followed by soup and snacks. Join us for a winter sky talk with guest speaker John Meader of Northern Stars Planetarium. Calling all high school teams and skiers who are not in the KVAC, MVC, WMC, or Aroostook conferences! Central Maine Ski Club will be hosting a race at Quarry Road on Saturday, February 9th for all high school skiers not participating in a conference championship race that day. Group and self-guided ski and snowshoe tours, followed by soup, snacks. Due to overcast conditions, the winter sky talk with John Meader of Northern Stars Planetarium. has been rescheduled to Thursday Feb 21. Join us on Feb 7 for a ski waxing primer. Central Maine Ski Club hosts a Maine Junior Ski League relay race. Division I NCAA ski races come back to Waterville! Group and self-guided ski and snowshoe tours, followed by soup , snacks and a guest speaker TBA. Local residents and visitors are invited to enjoy a day of cross-country skiing and other winter activities at Quarry Road Trails in Waterville on Saturday, January 12. This free community event, hosted by the City of Waterville, is the second of three Community Ski Free Days scheduled for the 2018-2019 winter season. The Welcome Center will be open from 10 a.m. until 4 p.m. to provide free snowshoes to loan, ski equipment rentals, snacks, and information. Ski and snowshoe trails are open all day throughout the season with lighting on over a mile of trail for night skiing until 9 p.m. Quarry Road Trails’ state-of-the-art snowmaking system ensures that the ski trails are covered even in periods of low natural snowfall. The Central Maine Ski Club after-school ski program for grades K-8 kicks off on January 7. The program runs Monday, Wednesday, and Thursday afternoons until February vacation. For first-timers, this program is a great introduction to the sport in a fun, caring environment. For more experienced young skiers, it's a great opportunity to build skills and have fun with friends. 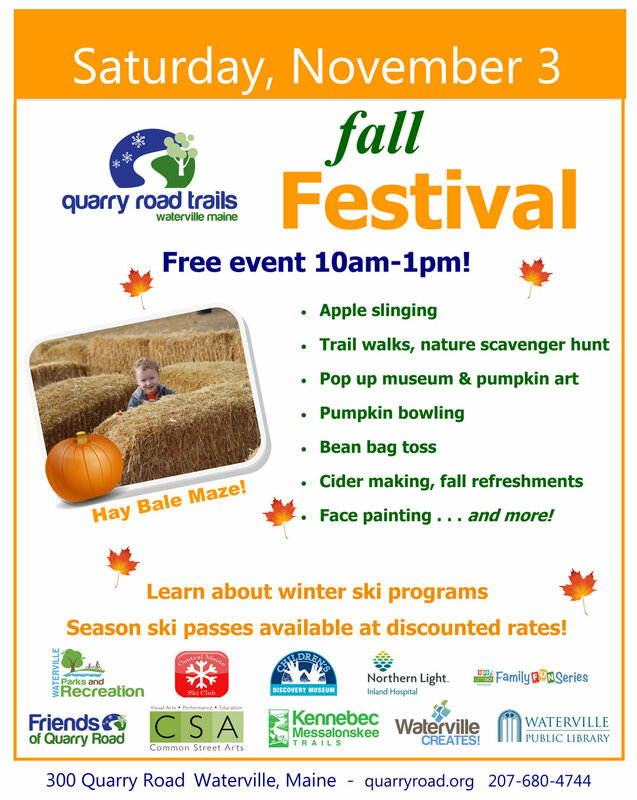 Local residents and visitors are invited to enjoy a day of cross-country skiing and other winter activities at Quarry Road Trails in Waterville on Saturday, December 15. This free community event, hosted by the City of Waterville, is the first of three Community Ski Free Days scheduled for the 2018-2019 winter season. The Welcome Center will be open from 10 a.m. until 4 p.m. to provide free snowshoes to loan, ski equipment demos (first-come, first-served), free learn-to-ski clinics, snacks, and information. Ski and snowshoe trails are open all day throughout the season with lighting on over a mile of trail for night skiing until 9 p.m. Quarry Road Trails’ state-of-the-art snowmaking system ensures that the ski trails are covered even in periods of low natural snowfall. The Central Maine Ski Club is happy to announce the 2018 Quarry Road Opener is planned for Sunday, December 9th. This will be a skate race, open to all ages, from Bill Koch youth through Masters. For full details and schedule of events, see the Central Maine Ski Club web site. The Quarry Road Welcome Center will open for full-tie winter operations on Saturday, December 1. At that point we will be open daily from 10 am until 4 pm. Lights will stay on for night skiing until 9 pm. Stay tuned to Quarry Road Trails on Facebook for updates. Order your season pass before December 1 to lock in the best rate of the year. Learn more. The Central Maine Dryland Challenge dogsled event will include numerous canine-powered races -- including bike, scooter, four dog and six dog dryland dogsled classes, and canicross (people running with their dogs) -- over two days. These are exciting events for spectators and participants alike and make great photo opportunities. The Central Maine Dryland Challenge promises to be very well attended, with participants coming from all over New England and from Pennsylvania to Canada and the midwest. The race will be sanctioned by the International Sled Dog Racing Association (ISDRA) and accredited by the International Federation of Sled Dog Sports (IFSS). Would you run a mile for free cider and doughnuts? These events are a great opportunity to mix and mingle with other business professionals and leaders in our communities. Complimentary hors-d'oeuvres and beverages are available, as well as a 50/50 raffle and door prizes donated by area businesses. Don't miss out on these great networking opportunities. No registration required; admission is free. Waterville Music Boosters welcomes you to join us as we run, walk, and jog while raising funds for our school! This fun run/walk is open to EVERYONE in the community and we hope to see you there! The My School Color Run is an untimed fun run/walk featuring a 5K. Throughout the course participants will experience color splash zones where they'll be doused in color and end with a final color toss celebration! AND don't forget to share your pictures before/after the event! Registration opens at 5 p.m.; FREE kids fun run at 5:30 p.m.; featured race starts at 6 p.m. The Quarry Road Summer Race Series is a fun, family-friendly, weekly trail running series. Our goal is to provide a summer of great experiences for runners in the greater Waterville area. Each week participants will complete different courses of varying lengths from 3k to 8k, utilizing the full extent of the Quarry Road trail system. Join us for a single race or participate all summer long to compete for the overall series title. For more information, please visit the Quarry Road Summer Race Series web site.